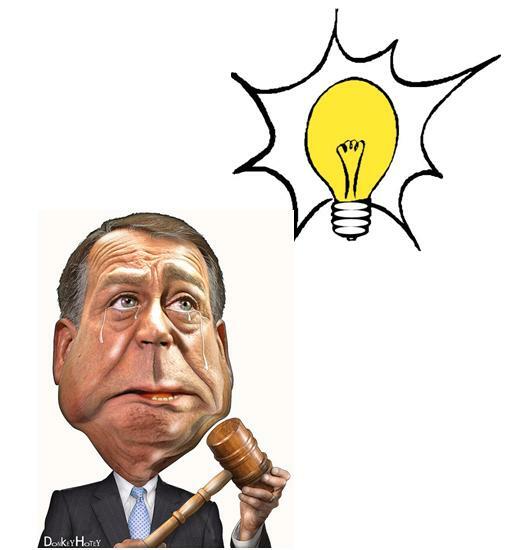 104 N. San Jacinto St.
Subject: John Boehner – Can we talk? Establishment Republicans have openly declared war on TEA Party patriots like me. One in particular is Speaker John Boehner. He and Sen. Mitch McConnell seem to be speaking from the same script, declaring how we are “bullying” our elected Representatives to vote our way. You have known me now for a few years. We have come to be friends. Not once have you been threatened, bullied, assaulted or blackmailed by me or any other member of our Rockwall County TEA Party. Perhaps the Speaker feels threatened because we actually read the bills coming before the House floor for a vote. It could be the fact we call and write you to communicate our viewpoints on various bills. It’s entirely possible, his being from Ohio and all, that he has become so conditioned by big labor bosses that he just can’t relate to people from a right-to-work state like Texas and more specifically, the Fourth Congressional District, where we think for ourselves. Will he see the light? As you go about your daily business, I hope you can take time to pass Mr. Boehner a note, one of those hand-written notes that convey your personal touch. Who knows? It’s possible. Anything’s possible. A little light might suddenly appear above his knucklehead, an epiphany: we of the TEA Party aren’t a political party; we are a grassroots movement of Republicans. The best way to characterize us is to say, we are the Republican Wing of the Republican Party. Last of all, if you’re unable to reason with your friend from Ohio, then I ask you to get that jackass away from the gavel and give the job of Speaker to a red-blooded American who will stand up against the statists like Barack Obama, Nancy Peosi and Harry Reid. Have a marvelous New Year, Congressman.